The Sheraton Grand at Wild Horse Pass is one of the most highly acclaimed resorts in Arizona. Only about 20 minutes from Phoenix Sky Harbor International Airport, you'll travel south, away from Phoenix to the tribal land of the Gila River Indian Community. Away from the traffic and the fast food chains and bars of Phoenix and Scottsdale, you might say it is off the beaten path. This jewel in the desert, and the nearby enterprises of the Gila River Indian Community, offer everything that a family, or a business traveler, or a couple on a romantic staycation might want from a resort. If you have to get to some hustle and bustle, that's a reasonable drive away! Aside from having what many believe to be the best restaurant in Arizona, this resort pays more than just superficial homage to the Native American history here that goes back more than 2,000 years. The resort was designed and built with the approval of a committee of tribal leaders. That means that the direction of the doors, the murals on the ceilings, the design of the lobby and the guest rooms — everything is placed and organized to share the cultural significance with resort guests. You'll find signage scattered throughout explaining the relationship of the resort to the river, to the horses, and to the environment. 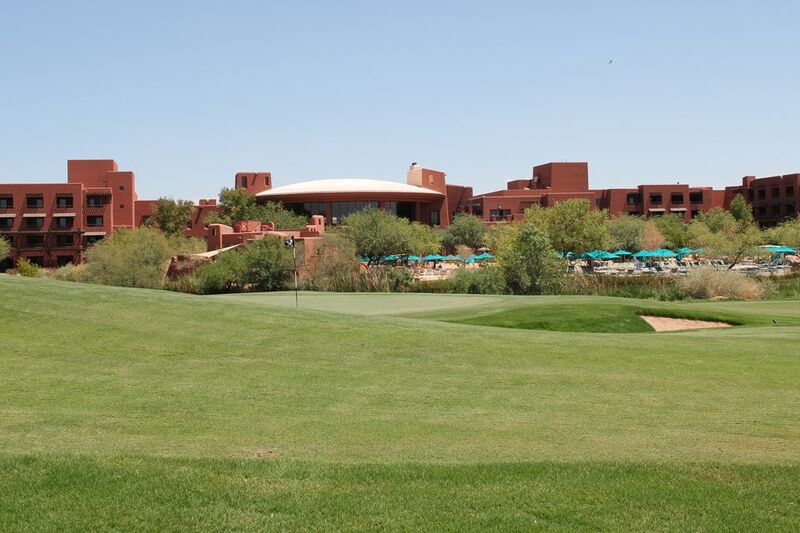 You can choose to not pay much attention to it at all and just acknowledge the resort as attractive (which it certainly is) or you can embrace the experience that the Gila River Indian Community has chosen to share. See what people posting at TripAdvisor have to say about Sheraton Grand at Wild Horse Pass, and check rates and availability. Like most luxury resorts, you can find a sandwich, snack or beverage at several resort locations, including at the Hanyo Grill at the pool, where you'll find a full bar and lunch selections, and the Link@Sheraton Cafe in the lower lobby near the computer room where you can grab à la carte breakfast items. Make sure that you keep the Aji Cafe at Aji Spa on your radar for freshly prepared salads, flat bread pizza and more for lunch. For a change of pace, take the shuttle over to Whirlwind Golf Course's Sivlik Grill (breakfast, lunch) for patio or dining room dining on creative menu items with lovely golf course views. For dinner, though, you have two choices for your dining experience. At Ko'Sin (means "kitchen") the menu is not extensive, offering just enough selections for meat, fish and vegetarian diners to find an appealing selection or two. Utilizing sustainable, fresh and local ingredients where possible, the Native American influence is apparent in the dishes. The dining room is spacious and comfortable, and Ko'Sin is the place where the resort often sets up special holiday dinners and buffets. Resort casual attire is appropriate, but a dress code is not enforced here. Enjoy the nice, large, comfortable chairs indoors, and the patio when weather permits for al fresco dining with pool, golf course and mountain views. The signature restaurant at the Sheraton Grand at Wild Horse Pass is Kai (rhymes with "eye"), which consistently garners the highest accolades for restaurant dining in Arizona. Known for it's lovely views, especially at sunset, this is also one of the only restaurants in Arizona that has a dress code! Business casual attire is appropriate at Kai. Shorts, tee shirts, athletic shoes and flip flops are not appropriate here. They prefer that guests not wear jeans. Will they ask you to leave if you are wearing shorts or jeans? Probably not, but you'd better not look sloppy or ragged! This is probably not a restaurant for young children. The dining room at Kai is rather small, so make reservations well in advance of your visit. The wine list at Kai has been recognized as one of the best in Arizona by Wine Spectator. As for the food, the "Native American with Global Accents" concept was invented by the Chefs of Kai. You won't find these dishes anywhere else. In my opinion, this kitchen is inhabited by mad chef-scientists, who are constantly dreaming up ways in which to combine ingredients and flavors into dishes that are surprising, lovely to look at and wonderful to eat. Some dishes are pungent, some are sweet, some are spicy, some are smoky. From the hand-painted menus, to the choice of citrus accents for your water, to the specially designed wine glasses, to the olives from a local Native American community (pressed locally) used to create an extra virgin olive oil in which to dip three varieties of wonderful special breads, to the silverware and dishes, not an opportunity is missed to accent the creative cuisine with exquisite touches and flavors. Service at Kai is beautifully choreographed, and special touches and surprises make this dining adventure more than just another nice dinner. It's a memorable experience. What is There To Do at Sheraton Grand at Wild Horse Pass? Of course you can lounge by the pool or enjoy the comfort of the lobby bar in your free time. But there's so much more to do! The Sheraton Grand at Wild Horse Pass has staff members who are not just trained to give guided tours; they live the culture about which they speak. Resort guests and the public are invited to schedule a guided culture tour of the resort, where you will learn about the history of the property and the significance of the artwork displayed there and the features that are woven into the design of the property. Read more about the Culture Tour at The Sheraton Grand at Wild Horse Pass. Luxurious spa treatments at wonderful resorts abound in the Valley of the Sun. At Aji Spa, however, you can experience treatments inspired by and presented by authentic Pima and Maricopa practitioners. Aji Spa's indigenous spa experiences include the VACHK at The Pond, an Indigenous Water Treatment. During this experience, the water allows for movements orchestrated by Belen, a trained Cultural Caretaker, and not possible on a traditional massage table. You will wear a bathing suit in The Pond while you are immersed, both literally and spiritually. If having your ears under water is uncomfortable, I recommend a bathing cap or earplugs for this totally relaxing — almost hypnotic — and unique treatment. Other therapeutic massages and meditation sessions are offered in the Indigenous Collection at Aji Spa, in addition to an array of massages, aromatherapy sessions, facial treatments. You can even combine a horseback ride, massage and lunch! While we are on the subject of horseback rides, The Sheraton Grand at Wild Horse Pass features the Koli Equestrian Center, about five minutes away by resort shuttle. Open to the public as well as to resort guests, these horses are not necessarily the kind that blindly follow in a straight line. People arranging for rides here are certainly of differing experience levels, but you are expected to be able to get on the horse and know how to control a horse in order to ride. On private rides, light trotting may be permitted if requested, but always with a guide. The Center will accept reservations for one person or groups. While the terrain is rather flat in this desert area, and there is only one challenging crossing, the treat for lucky riders will be sightings of the wild horses of Wild Horse Pass. You might see other desert creatures as well. I saw a sidewinder on my ride! Koli Equestrian Center operates with a reduced number of horses and staff during the summer. During those months you may arrange for early rides, before the desert heat becomes uncomfortable. Long pants and a long-sleeved shirt are advisable to protect from sun and bugs. Check online for specials like sunrise rides, wagon rides, sunset rides. Guests must be at least six years old to ride. A man-made calm river is the perfect place for a relaxing trip, just over a mile each way. Rent pedal boats, hydro bikes, single and double kayaks, and stand-up paddle boards. Open to the public, you can rent your chosen mode of river transportation by the half-hour or hour. Kids may be accompanied by an adult in a pedal boat or double kayak. Don't worry about falling off the paddle board or capsizing your kayak in this river; the water is clear and treated, much like a pool There are rocks, though, so responsible operation of the equipment is expected. Waivers are required to be signed to use the equipment. One of my favorite public golf courses, Whirlwind, is a shuttle stop away from the resort. There you'll be challenged by 36 holes of championship golf on the Cattail and Devil's Claw courses. These are both desert courses. Devil's Claw has tee boxes with ratings/slopes ranging from 72.6/129 (7029 yards) to 71.4/124 (5540 yards). Cattail's tee boxes have ratings/slopes ranging from 73.4/1 32 (7334 yards) to 70.8/123 (5383 yards). Make sure you check for special golf getaway packages at the Sheraton Grand at Wild Horse Pass that include golf and range access. Naturally, this resort has pools! The main pool, a children's wading pool and a waterslide. Those are especially inviting during the summer months, when you can take advantage of specially priced package deals. Sheraton Grand at Wild Horse Pass is about 17 miles from Phoenix Sky Harbor International Airport. Sheraton Grand at Wild Horse PassDisclosure: The company provided free access to this service for review purposes. For more information, please see our Ethics Policy. Get directions to Sheraton Grand at Wild Horse Pass and see it on a map. What's Near Sheraton Grand at Wild Horse Pass? Phoenix Premium Outlets for shopping at some of the most popular clothing, shoe, and accessory stores. There's a food court, too. Whirlwind Golf has a great driving range, 36 holes of championship golf, a great pro shop, Sivlik Grill for breakfast and lunch. You can rent Callaways at Whirlwind. Koli Equestrian Center for trail rides, carriage rides and corporate parties. NHRA Racing at Wild Horse Pass Motorsports Park as well as boat racing, and other events. If you have a car with you, there are designated nights for drag racing! Rawhide Western Town and Event Center has staged gunfights, a petting zoo, pony rides and other entertainment for mostly the younger crowd. Hayrides and cookouts are popular for corporate meetings. There's a steakhouse here with live music. You can try the deep fried rattlesnake appetizer (it tastes like chicken). Ko'sin is your go-to restaurant on the property for breakfast, lunch and dinner. Special holiday brunches, like Easter, Mother's Day, Thanksgiving and Christmas, usually take place here. You can watch the golfers enjoying their round from your lounge chair at the pool! Kai is a special place. Food, beverage and service are all forms of art, and if you are lucky and time it right, you'll catch a beautiful sunset. Not sure where the kids are? They are probably at the waterslide! Get moving on a paddleboard or kayak or other personal watercraft at the River Adventure. Open to resort guests and the public. Aji Spa offers a menu of spa indulgences that you won't find at any other resort. The Indigenous Collection of treatments introduce guests to Native American methods of massage and relaxation. There's a lovely pool and a cafe there, too. The Deluxe Suite at Sheraton Grand at Wild Horse Pass is colorful, roomy and comfortable, with luxury amenities. Play one of two 18-hole courses at Whirlwind at Wild Horse Pass. Check with the resort to see special packages for stays that include golf.